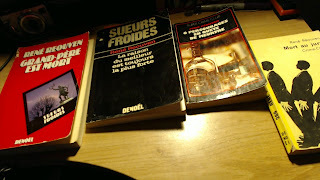 I recently made many new acquisitions to my book collection, many of them in French. 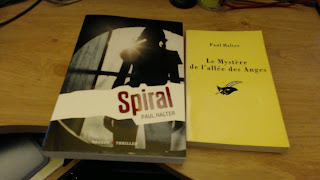 Those of you who read this blog regularly will by now know that I regularly read and review French mysteries on here, especially the work of Paul Halter. But there are some other authors whose books I’ve acquired recently, and I’d like to take this time to show off the new books—these are French mysteries you can look forward to my reading and reviewing in the near future, with a few more in the mail that I expect next week. What is the point of all this? Well, I want to show off, and since I have a blog, I can do it. The regularly-scheduled programme will be back soon enough. First up, we have the work of Paul Halter. I bought a used copy of Le Mystère de l’allée des Anges (The Mystery of Angels’ Lane; right) as well as a copy of his brand new young adult novel Spiral. 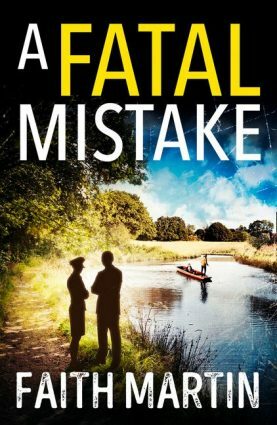 TomCat also reviewed the next author featured here: Maurice-Bernard Endrèbe. His review of Elvire à la tour monte (Elvire Climbs the Tower) was far from enthusiastic, however, and he tore its impossible crime to shreds. (I’ve since found out what the ending was, and I must agree it’s a complete let-down.) Endrèbe was far more prolific as a translator, famously translating John Dickson Carr’s The Burning Court. 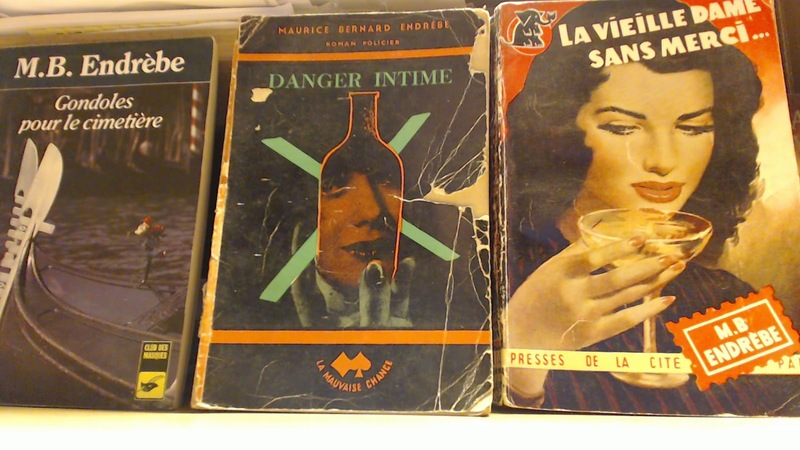 But he did write some of his own books—one of these, at the far right, is his only other ‘impossible crime’ novel, La Vieille dame sans merci (The Old Lady without Mercy). 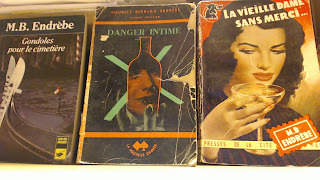 The other two are Danger Intime (Intimate Danger) and Gondoles pour le cimitière (Gondolas for the Cemetery). Last, but not least, is a book I’ve been eager to find for a long time. 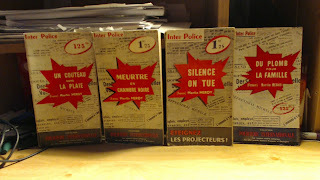 It is the French equivalent of Robert Adey’s classic bibliography Locked Room Murders. Titled Chambres closes|crimes impossibles (Locked rooms|Impossible Crimes), it is a French-language survey of the impossible crime sub-genre. Not all of these books are French—in fact, quite a fair chunk I’ve seen are English-language novels—but it promises to portray quite a bit of the French impossible crime landscape with spoilers very cleverly hidden while being stated. (It’s a long story.) 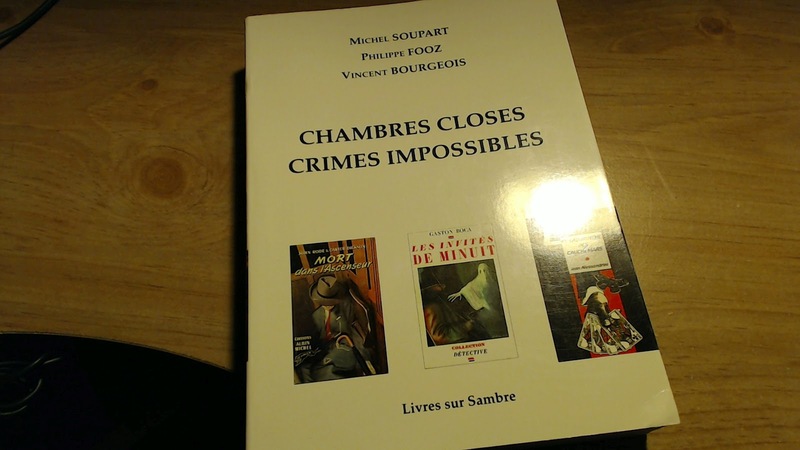 My copy is also inscribed by one of the authors, M. Philippe Fooz—I’m very grateful to him for having pointed out several French novels I would enjoy, and his list of suggestions played a major role in these recent acquisitions. Merci beaucoup! J'attends encore deux livres de S. A. Steeman-- "L'assassin habite au 21" et "Légitime defense"-- ainsi que "Six crimes sans assassin" de Pierre Boileau et "Un trésor dans l'ombre" de Rene Reouven... et, bien sur, le nouveau Paul Halter qui sortira en avril, "Le Voyageur du Passe". Thanks for the plugs, Patrick! Sorry if I have been quiet in the comment sections lately, but I have had stuffed agenda.